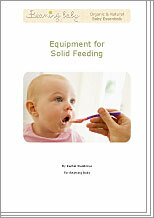 Equipment for Solid Feeding, simple list of things needed by Mum and Dad when feeding your baby. It is easiest to feed your baby when he is sitting up in his chair, but you can feed him on your lap, supporting him with your free arm around his back. Rachel provides a list of all the things you will need when feeding your baby. What do you need for Solid Feeding?